My dehydrator earned its keep this week. 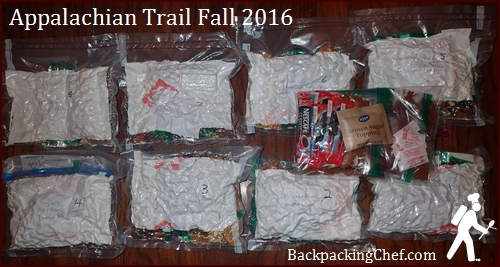 With only a few days available to prepare and dehydrate food for an 8-day Appalachian Trail hike, I got it done in four loads with my 9-tray Excalibur. 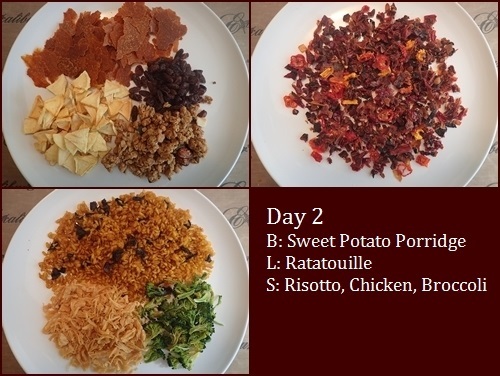 Visit the BackpackingChef Facebook page to see pictures of what I dried in each load. I divided the loads by category. First load: Fruit. Second load: Meat & Eggs. Third load: Vegetables. Fourth load: Starches. 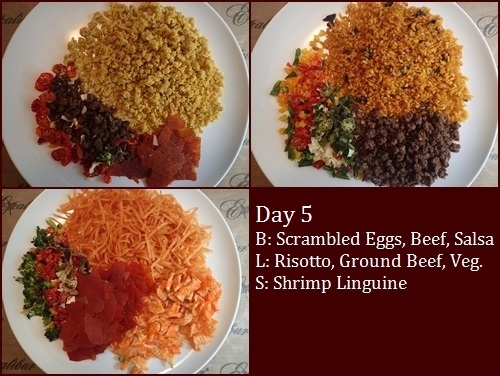 I only need a lunch and supper for Day One. The morning starts off with a shuttle from Harpers Ferry, WV to Elkwallow Wayside in Shenandoah National Park. I’m hiking northbound about seventy-five miles back to Harpers Ferry. I start off the feasting with my favorite meal, Chili. Supper is root stew. It is made with sweet potato, parsnips, rutabaga, turnips, onions, tomatoes, and garlic; seasoned with curry, cumin, and cinnamon. 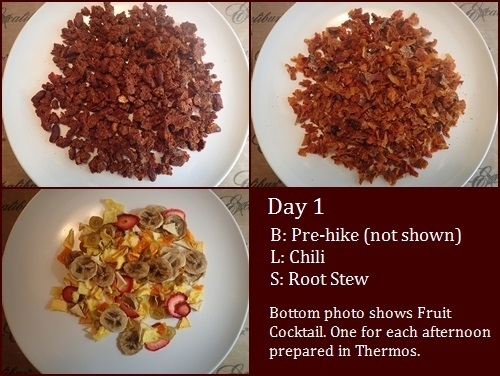 Also shown in the photo is a cup of dried assorted fruit that will go into the Thermos Food Jar for an afternoon fruit cocktail each day. All lunches will be prepared in the mornings using the Thermos. Starting off the day with a pot of hearty Sweet Potato Porridge. Scrambled eggs and polenta are accompanied by ham, tomatoes, and salsa. I’m carrying a 6-oz block of cheddar cheese to add to eggs and other meals. I’m making blueberry squeeze-bag yogurt with fruit for breakfast on Day Four, but I forgot to take a photo. Lunch is BBQ mashed potatoes with beef, okra, and corn. I had BBQ potato bark on hand from March. It was vacuum sealed in a large-mouth mason jar, as was the yogurt. Supper on Day Four is tuna mac & cheese with mixed vegetables. Beef and salsa with scrambled eggs for Day Five breakfast. More beef for lunch in the risotto. One of my new favorite meals for supper: shrimp linguine in marinara sauce. I added a little pumpkin flavor (pumpkin pie bark) to the oatmeal for Day Six. I do not need a supper this day because I will be staying at Bears Den Hostel. They have a hiker special that includes pizza and a pint of ice cream. 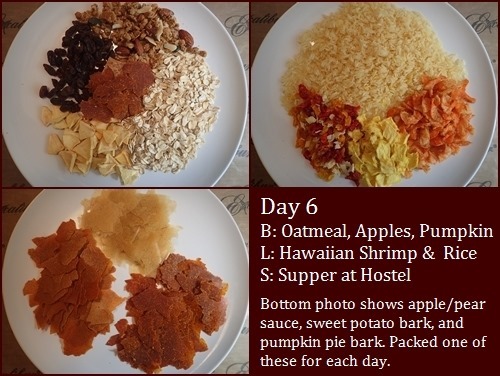 The photo shows an option for daily snacking: apple/pear sauce, pumpkin pie bark, and sweet potato bark. I packed one per day in a separate bag that is not vacuum sealed. The pressure of vacuum sealing makes fruit leathers stick together. I will eat these treats as the mood strikes me in one of three ways: right out of the bag, heated with water into pudding, or rehydrated in the Thermos overnight with cold water for a morning smoothie. Bears Den Hostel provides a pancake breakfast. For my Thermos lunch, I’m making unstuffed peppers. For supper, I’m having BBQ mashed potatoes with ham and mixed vegetables. I made rice pudding with vanilla-almond milk. It’s very sweet. Lunch will be mashed sweet potatoes with beef and mixed vegetables. No need for a supper on the last day. The photo also shows the variety of snacks that I will carry, two items per day. I usually start snacking an hour or two after breakfast. 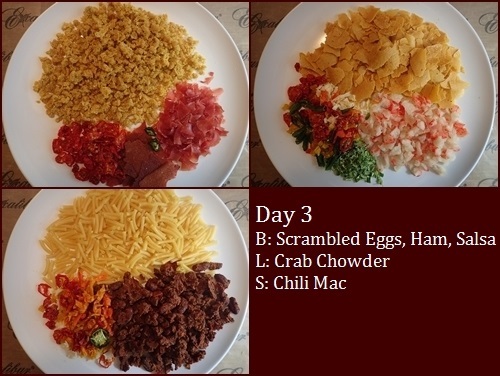 The packaged weight of eight days of food (including a 6-ounce block of cheddar cheese) is 10.25 pounds (4.6 kg). The daily average food weight is 1.28 pounds (.57 kg). I’m carrying all eight days of food to start the hike since I didn’t have time to mail a food drop ahead. 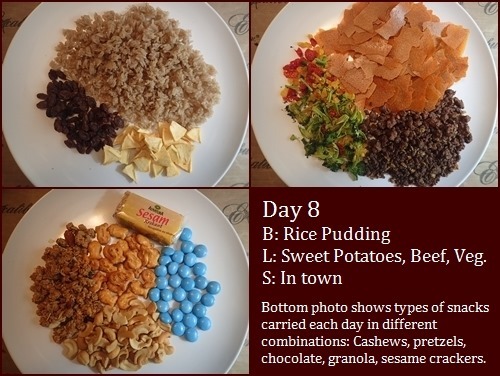 The pack weight will get lighter each day as I eat the delicious meals. All serving sizes are large as described in Recipes for Adventure. I will cook with denatured alcohol using my simple tea light cup stove and will pre-heat meals during the soak phase with three tea light candles to stretch my fuel supply. I'm looking forward to exploring Harpers Ferry, WV and stopping by the Appalachian Trail Conservancy office. I only wish that Dominique could have taken this hike with me. She and Cedric arrive in America the day after I get home. I’ll have a trip report of the hike in next month's newsletter. See you then!